Melbourne bespoke industrial furniture designer admits his long family history of timber business owners ignited his passion. Custom Industrial is a unique furniture and lighting design company specialising in the re-purposing of old machinery, parts and unusual items into exclusive pieces. The decision to incorporate old machinery parts into my unique custom made furniture was just a natural progression for me, as I feel it’s something I love just as much as timber. Coming from four generations of timber importers, Melbourne custom furniture builder, Durwin Lambe has timber and woodworking running through his veins. He says his love affair with timber began as a child, and recalls spending a lot of his early years exploring timber yards, and learning the timber trade through those around him. Born in South Melbourne in 1865, Durwin’s great grandfather, William Henry Dyson started the family business of timber handling and transportation with his three sons, including Durwin’s grandfather, Aubrey Nigel. When his grandfather passed away, exactly two weeks after Durwin’s birth, Durwin’s aunt, Beverley Jones took the reins and directed the company for 23 years. Melbourne-born Beverly was the first woman to ever run a company down at the Wharf, and continued to attend meetings and communicate with the Melbourne Harbour Trust as the only woman in a male dominated field for over two decades. “I used to climb up high and sit on top of the packs, and look down at the machines. Many of them were over 60 years old, and I would think about how my grandfather would have operated them. The smell of grease and oil mixed with raw timbers was etched in my mind back then. Add to that the visual of a then undeveloped docklands – huge holding sheds, bluestone streets and a patina over everything that showed years of purposeful use. It was just a natural feeling to be there,” the Melbourne custom furniture builder says. Durwin’s decision to work with timber and his hands was, in his opinion, a predetermined path. His grandfather was a self-taught man who had a woodworking talent, and built everything for his family from furniture, the home and even a caravan. Almost everything that Durwin uses to build his unique custom made furniture is rustic, reused or redesigned, and therefore has a patina, a soul to it, which makes it extra special. According to Durwin, ‘character can’t be built into a piece of furniture straight away’; it evolves over time from being used. “I still pinch myself every day because I feel so blessed to have an opportunity and a platform to do this,” says Durwin. 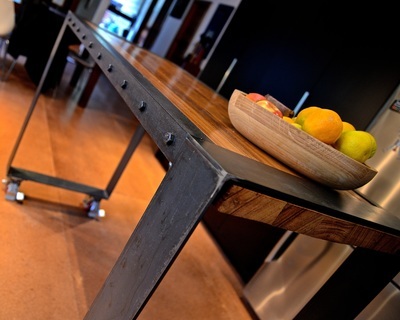 To see how beautifully unique Custom Industrial’s bespoke industrial furniture is, visit www.customindustrial.com.au. Custom Industrial is a unique furniture and lighting design company specialising in the re-purposing of old machinery, parts and unusual items into exclusive pieces. Everything Custom Industrial creates is individual, using timeless craftsmanship. Their products are made to last using the best measure of both time-honoured techniques blended with modern day efficiencies. The business was born from a love of the unique and interesting, and influenced by the founder’s family history working in and around the wharves, surrounded by patina worn, heavy industrial machinery. Combining this with skills gained in the building and timber industries, a passion was fuelled for turning the unusual and unique into custom pieces of furniture and lighting that captured the feeling of those childhood memories.